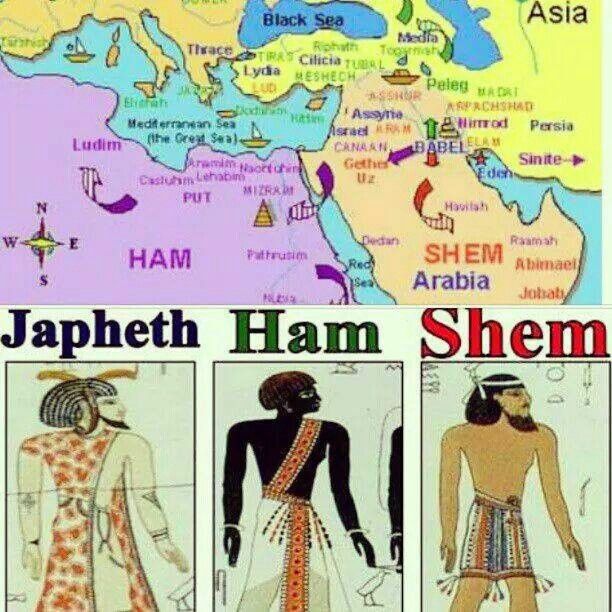 Henry Morris’s “scientific creationism” taught that red, black, and yellow races were descended from Ham, and destined to serve the Europeans and Semites descended from Japhet and Shem. Evolution science, with the help of genetics, wrote in 1977 that “race” applied to humans is a hopelessly blurred concept, that Europeans, Middle Easterners and East Asians are more closely related to each other than to Africans, that the greatest human genetic diversity is within Africa, and that human group differences are trivial compared with individual variation. That should get tongues wagging. Most creationists will deny that and Ham of Answers in Genesis tries to blame evolutionists for racism. This attitude is typical of the whites in the Southern States and was held by some Southern Presbyterians at the time of the civil war. Posted on August 18, 2018, in Creationism, Evolution, Humans and tagged Creation Science, Creationism, Curse of Ham, Henry Morris, Human races, Japhet, Race, Shem. Bookmark the permalink. 6 Comments. It’s worth noting that many traditional versions of creationism had whites and blacks as distinct and separate creations, and thus were explicitly racist. It was Darwinism that was the first to unambiguously state that all humans descended from a common ancestor. The Nazi ideologues held to the creationist, polygenist idea, in which other races (Jews, blacks, slavs, etc) were distinct “untermensch” in the sense of being literally separate creations. There’s no question that the Great Chain of Being, while originating in Aristotle, is inherently racist. The classical idea grafts perfectly onto Christian ideology about creation–orderly, static, hierarchical. In the same way that worms are “lower” animals than lions on the chain, so, too anyone non-white was “lower” than the whites. socioeconomic class structure, racism, speciesism–it all goes back to the Great Chain of Being (or Ladder of Life). Darwin and Wallace kicked that right over. Separate species meant, to a creationist, separate creations. OK, I guess some creationists would have “kinds” as separate creations, and allow several species emerging from a “kind”, but that is a relatively modern form of creationism, responding to Darwinism. The idea that the different human races were separate creations was argued, for example, by Arthur de Gobineau (1816–1882) in his book “Inequality of the Human Races” , which was a pre-cursor to Nazi ideology. “… there is nothing to show that, in the view of the first compilers of the Adamite genealogies, those outside the white race were counted as part of the species at all. Not a word is said about the yellow races, and it is only an arbitrary interpretation of the text that makes us regard the patriarch Ham as black”. I looked into all this a while back when I wrote a piece on: Nazi racial ideology was religious, creationist and opposed to Darwinism. The creationist and anti-Darwinian nature of their ideology is routinely downplayed.